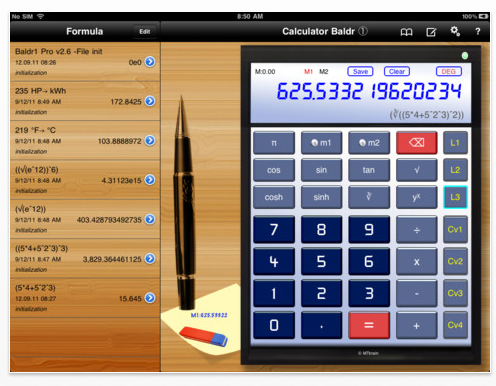 MTbrain IOS Development today is proud to announce version 2.6 of the Scientific Calculator B1, a scientific calculator for iPad/iPhone/iPod touch. The main design pattern was to create a powerful, but easy and intuitive to use Scientific Calculator which ensures the continuous workflow from ‘end-to-end’. Unlike many ‘calculate & forget’ calculators, this calculator supports the transparent and reusable operation as it is necessary in science, school and office. This calculator itself uses the arithmetic Infix-Notation system which has been developed by MTbrain from the ground up. A wide range of mathematical operations and of common conversion functions are supported, including logarithms, trigonometric functions, roots and arbitratry exponents. During the whole operation the calculator displays the complete calculation path for each single calculation step. Operators and Brackets are checked and set automatically. The final results and formulas can be persist in the flash memory and as a full record in the internal database as well. The records can be commented for later documentation and can be reused in every detail to continue later operations. The Database records can be sent via email in normal text format for the universal use in other documents. 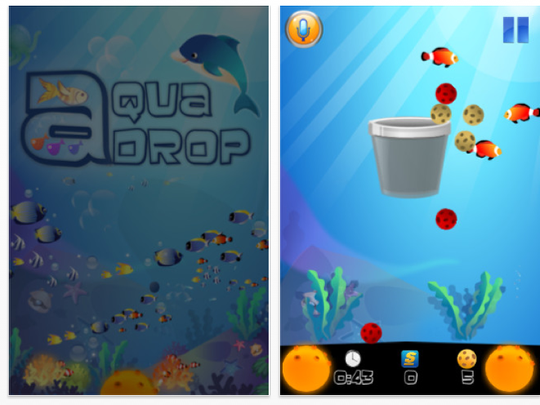 Power App today is pleased to introduce AquaDrop 1.1 for iOS, an update to their casual Game where play takes place underwater, and players must use streams of bubbles to push balls up from the sea floor and into baskets. Featuring advanced underwater game physics, the arcade game includes left and right bubble jet controllers, which must be tapped repeatedly to create a continuous stream that will carry balls upward. 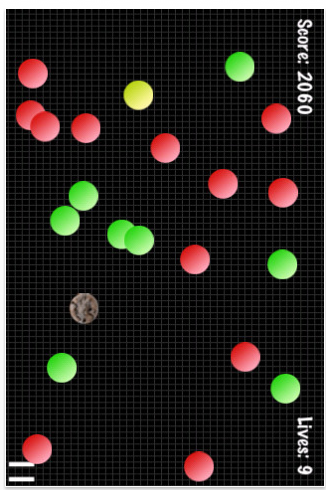 Players can influence the ball’s horizontal movement by tilting their iOS device, trying to achieve the highest score in the least time. The game includes four levels of play, each with five stages: Angel Fish, Clown Fish, Dolphin, and Goldfish. The game offers a hypnotic quality, akin to gazing at multi-colored fish inside an aquarium. Fish swim by randomly, and plants sway back and forth in the currents at the sea floor. Mini soccer balls, just heavy enough to sink to the bottom, rest on the uneven seabed and slowly move under the influence of gravity and the gentle currents. Balls are identical, but there are two different colors, red and yellow. One and/or two- thirds up the screen are one or two translucent, plastic baskets (grey, red, or yellow). The goal of the game is to get the required number of colored balls into matching colored baskets in the allotted time (50 seconds). In Impacts, the player tilts the device to roll around a ball. There are red, green, and yellow balls which move randomly around the screen. The player starts off with three lives and 0 points, and if he/she collides with a green, 10 points are earned, a yellow: a life is earned, and a red: a life is lost. The game becomes more intense as the player earns more points. Scores are recorded locally and new high scores are automatically submitted to the OpenFeint leaderboards. Scores can be posted to Facebook/Twitter and OpenFeint challenges can be sent to friends to make the game more social and competitive. Trenchman is the first game released by appsplit, best known for their diamond pricing calculator My Jeweler and DiamPrice. Trenchman falls in the time-waster category and is sure to keep a lot of mobile gamers busy for hours. 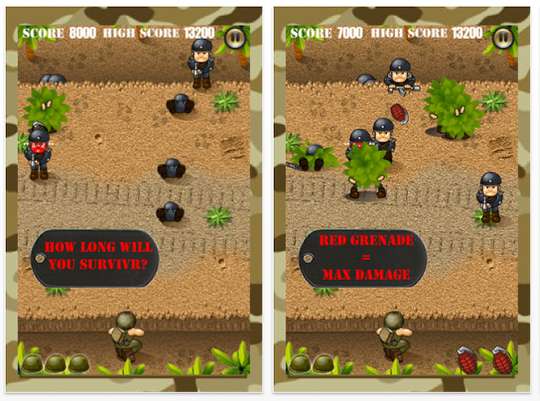 Gamers will be delighted with the basic yet addictive premise of Trenchman: surviving behind enemy lines when all you have at your disposal is grenades and your trusted trench. Of course, survival becomes increasingly more challenging as a gamer progresses through the game. Trenchman, which integrates game center, includes an achievements board and a leader board. The achievement board tests a gamer’s skill level with specific tasks whereas the leader board showcases overall performance of top Trenchman survivors. 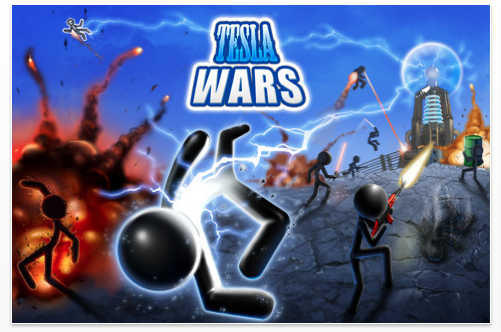 Tesla Wars is a game in a very popular genre "tower defense". Player will have to resist the onslaught of a huge number of enemies armed with almost all types of weapons – from guns to missiles. But he will get help of unique and powerful Specials, such as freeze or earthquake. In version 2.5.0 player will meet with 4 new kinds of enemies. Grasshopper uses a very lightweight propeller helicopter with the pedal motor. It’s armed with powerful missiles that’s why, in order to reduce the weight, it isn’t armored. In contrast Steel Hornet is a perfectly armored helicopter. This unmanned helicopter can use both guns and missiles in full automatic mode therefore it’s one of the most dangerous enemies. Scorpion is the first kind of enemy on SUV. The characteristics of his Hummer allow him to shoot only when he stops. And the last new enemy – Mad Mantis – is really dreadful commando who armed submachine guns with very high rate of fire. By the way he is genetically insusceptible to fear. 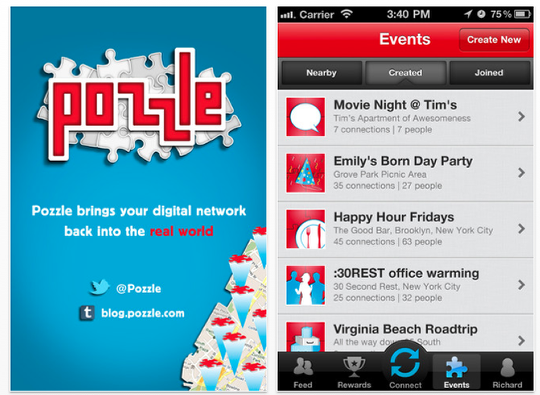 Pozzle 1.1 offers better social media integration through Facebook and Twitter as well as better event management tools such as iPhone calendar syncing and event photo icons. These further complement the app’s already existing ability to engage users, by offering event hosts the capacity to set rewards incentives for their events and hold attendees accountable through bump technology locked to specific event locations. "We wanted to add features that help streamline events across our client’s already existing social network." Co-Founder Charles Jamerlan stated, "This will make it easier and more fun for our users to connect in person." Everyone knows how difficult can be way to promote for corporate ladder and how much effort and ingenuity you must make for this. In this game you are offered to go through all levels of the corporation, from the security position to the rank of CEO. 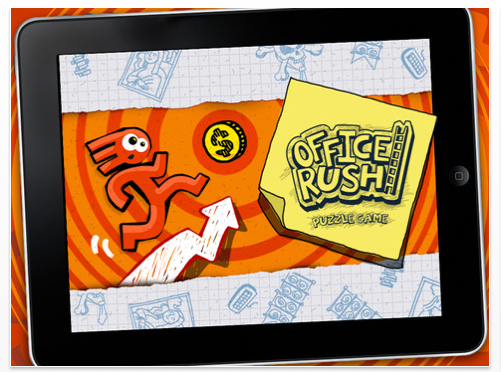 Office Rush throws users into a retro themed arcade adventure as they race to climb one corporate office floor after another en route to the tower’s top floor. With each new level the puzzles becomes more difficult, more dangerous obstacles appears and decisions should be faster. The game is quite simple and easily understandable for beginners and leaves the possibility to break a brain for most engage users. Stylized and unique design and fairly simple gameplay make Office Rush a nice arcade adventure game to help you understand what you are really able to do. Collecting the best from arcade and puzzle it will become a favorite pastime game. So, Office Rush is as good as it was. But now you can check the new opportunities crafted for improvement your gaming experience. At first, in new version there are new graphics and musical accompaniment. Also, there are new level selector and bonus coins on each of levels. Collect the golden, silver or bronze coins and then spend them to open special levels or buy a HINT! It will be a perfect help for those who consider that some of levels are too difficult. And finally, fix your best results in the Game Center’s score board. Have fun! New Farm Mania 2 HD is a fun and complex time management game created to test users multitasking skills. In the sequel players join Anna in her new endeavor to build up her own just bought farm with the help of her Grandpa and her close friends. The challenge of the game is to complete a great number of tasks within a certain time period to get money to buy upgrades and earn high score. Farm Mania 2 HD also supports user leaderboards to find out who is the best at farming. 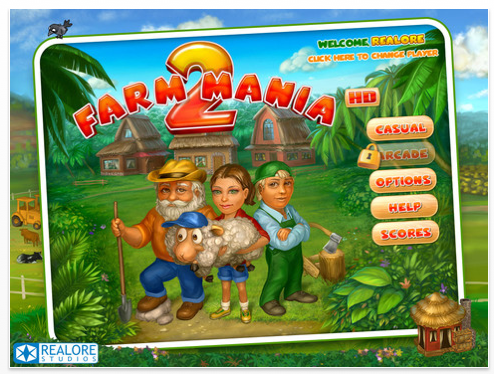 "We’re glad to announce the release of our second title in Farm Mania HD series. Since Farm Mania HD has already gained its fans on the iPad market, we are pretty sure that its sequel is also going to be a real success and attract thousands of new players all over the world. Taking advantage of the bright iPad screen, Farm Mania 2 HD will help everyone to relax and leave the noise of the city behind them" – said Natalia Matveeva, head of business development at Realore. Kanda Software, a leading software solutions firm, has today announced that version 2.0 of Mobilecast – The MS PowerPoint presentations sharing solution is now available on the Apple App Store. The app was developed to give presenters the power to broadcast individual slides and entire presentations directly to remote audiences equipped with iOS and other platforms. New additions to Mobilecast include unlimited slide sharing capabilities, Evernote integration, and automatic slide progressions which enable users to follow presentations remotely in real-time. Mobilecast for PowerPoint(R) version 2.0 is now available for download on the Apple App Store for $1.99 in the Productivity category. 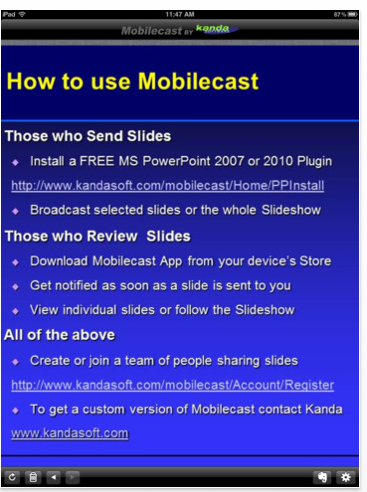 To start broadcasting Microsoft(R) PowerPoint(R) slides out to selected iPhone, iPad, or iPod touch devices presenters simply need to install the free Mobilecast plug-in from Kanda’s web site onto their personal laptop/ desktop and start PowerPoint(R). Once the Mobilecast icon on the PowerPoint menu bar is clicked the app is good to go. With Mobilecast activated, slides from the presenters’ PowerPoint window will appear on authorized mobile devices within seconds. There are no extra hurdles to jump through, no emails or attachments to open, and no added hassle. The plugin is compatible with both PowerPoint(R) 2007 and PowerPoint(R) 2010, and can send slides to an Evernote account as well as to mobile devices. "In today’s world where nobody has time to open attachments the instant view of that all-important slide can make the difference between a successful launch and a missed opportunity" – Alex Karpovsky, CEO of Kanda Software. Independent developer James Hollender today introduces Step 4 Moral Inventory Jr. 1.0, his new addiction recovery based app for iPhone and iPod touch. It provides an easy-to-use, detailed process by which persons participating in Addiction Recovery Programs can be aided in completing Step 4 of the 12 Steps without the use of any spreadsheets. It makes the task less time consuming, while at the same time helping the user create a valuable asset in their recovery process. 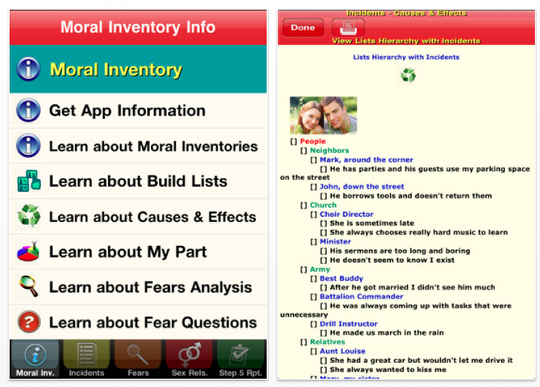 Although this app is designated "Jr." it still has the same capabilities as the parent app, "Step 4 Moral Inventory" for the iPad, but the user interface has been completely redesigned to accommodate the much smaller iPhone and iPod touch screen size. 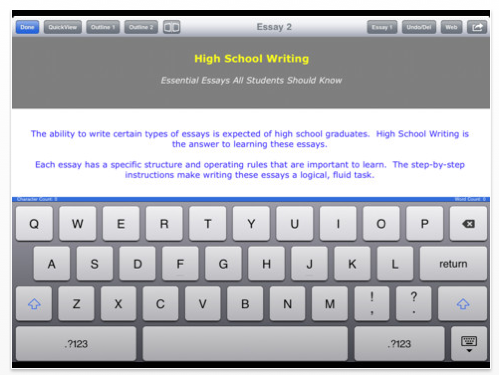 Niles Technology Group today is pleased to announce a major update to its High School Writing app. The iPad and iPhone app combines two essential parts of high school writing: essays that all students should know and an expanded section addressing college application essays. With one purchase, schools fulfill their entire high school essay writing curriculum requirements. For parents, the app is perfect for the individual student because the instructional content is very comprehensive. The development of writing skills, in high school, is crucial to future success. High School Writing, for the iPad and iPhone, includes the ten major essays that students should learn. They are: Argumentative (Persuasive), Cause and Effect, Compare and Contrast, Descriptive, Expository (Informative), Five-Paragraph, Narrative (First Person), Narrative (Third Person), Opinion and Reaction (Response) Paper. Using Niles Technology’s proprietary step-by-step writing instructions, students are taught to critically develop arguments and how best to structure those arguments into a well-written essay. And, for the college-bound student, the app also teaches how to write the best college application essays possible. There is even a Live Help Desk for personal one-on-one assistance. High School Writing is currently having a Back to School sale at 30% off. Schools can easily volume purchase the apps through the App Store Volume Purchase program. The Niles app catalog is found in the App Store simply by entering "Niles" in the iTunes search. Developing critical thinking-based instructional content requires an in-depth knowledge of what students require to learn the task at hand. Therefore, it is important to have others, who understand the content’s goals to review and comment. Niles Technology has an Education Advisory Board that uniquely serves this purpose. The Board ensures that Niles Technology apps fundamentally improve students’ critical thinking, as well as increase overall productivity. 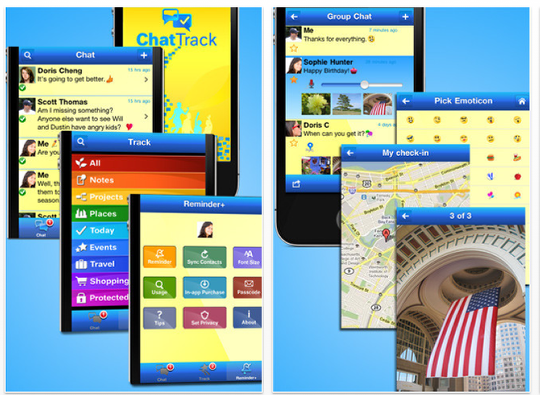 AllFocus, Inc., a software firm in the U.S., today is pleased to announce the launch of ChatTrack 1.0 on the App Store. It is targeted to the iPhone, iPad, and iPod touch users who want the full experience with one simple app to chat now, track easy, and remind always. Capture what’s happening with the multimedia tools at fingertips, and enjoy browsing in presentation style. If pressed for time, one can still be expressive by using quick phrases, emoticons, voice notes, or maps. If there is no Wi-Fi, write now and share later. If it’s a long story, the capacity of 20 rows to store up to 250 characters per row will come in handy. Reply to a group chat, add another topic, or send the same chat to another group, while the app tracks the respective chat history and participants. So a user will always know whom he’s talking to in the correct context. Also, sync often to keep the contact list and profile pictures up to date. Then, sharing can be selective thru the app or email. Or, post to Facebook for all friends to see via Facebook Connect. To check out what’s new, simply tap the badge counter. To wait for the best time to share, keep chats in draft first. Track the ideas by nine folders in a rainbow color scheme across the List View, Detail View, and Date View. Also, enjoy the flexibility to use the emoticons to visually make subfolders and to search fast, change the folder assignment now or later, or pick the quick phrases from other idea categories. To set the importance, flag the ideas with the TBD, Favorite, or Complete status anytime. Choose to post the tracks to Facebook, send them selectively via email or the app, or store them in the Protected folder with a passcode. Independent developers Pedro Santos and Ana Nogal today are proud to release LetsBasket+ their latest application on the Basketball series for iPhone and iPod touch. 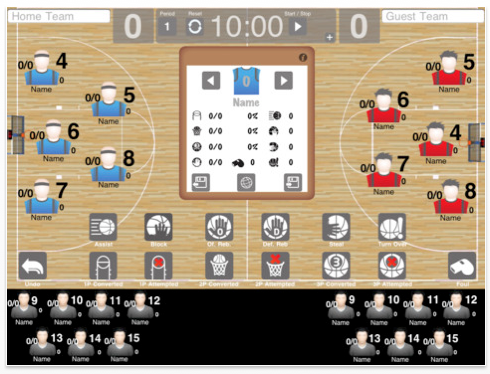 LetsBasket+ is a fun, simple and exciting tool that allows recording and sharing game events. With just the touch of a finger users can collect all game data including: teams, players, points, fouls, substitutions and more. Imbedded publishing functionality allows users to share their games on the web using LetsBasket online. LetsBasket+ is ideal for parents who love watching their kids play basketball or for anyone who has a loved one playing basketball. This app has been beta tested by leading photographers, graphics designer and iPad 2 users all around the world to ensure that it includes everything that any photo enthusiast would ever need. 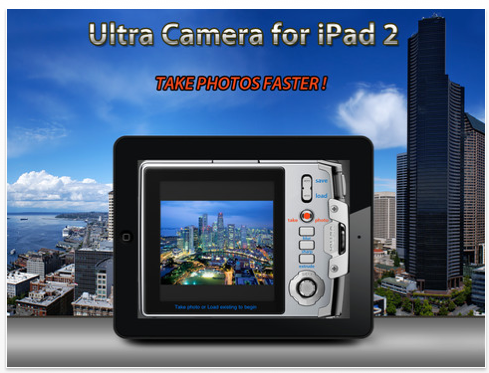 The user interface of "Camera Ultra" is so easy to use and straightforward, you don’t need a manual to start, words fail us, you just have to try it. Raj Bains today is pleased to announce Doozy 1.10 at a limited-time promotional price (only $0.99). Doozy, a play on the words "Do" and "See," is a visual calendar and tracking app which takes an original approach to productivity by representing events visually instead of in uniform lists or columns. 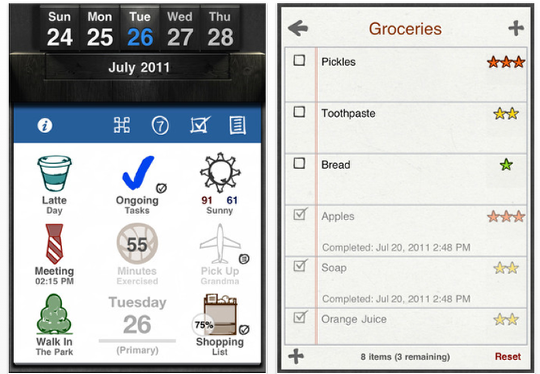 With Doozy, users can "see what they need to do" – literally! Events become interactive icons instead of just text on a screen – represented either by built-in icons (which can be tinted 10 different colors) or images from the user’s photo albums, which fade out or delete when marked as done, show the completion percentage of an attached list, quickly access notes and lists, record and display numbers, or even show the weather. In addition to visual event representations, Doozy makes heavy use of visual cues and color throughout to provide a unique productivity experience which is especially useful for visual learners and those who respond best to visual cues. The interface is designed to give users the most information at a glance. Doozy still contains the usual productivity mainstays such as multiple calendars, priority sorted lists, and notes, as well as advanced features such as graphing and tracking of progress over time – week-by-week, month-by-month. Fishington Studios announced today that it has released Map Draw to the iTunes App Store. Map Draw is the company’s latest iPad application in a series of health, fitness and productivity apps. "Initially inspired by iRunLog, we decided to create a map tracking application that could meet the needs of a diverse user base and which would be useful in not just one, but a variety of situations," stated Founder and CEO of Fishington Studios, Chris Flammer. "As a result, Map Draw was born". This application can be used for fitness training such as tracking a run or biking route or for social or business purposes that can range from coordinating a hike, planning a road trip, finding directions to a business meeting and much, much more. 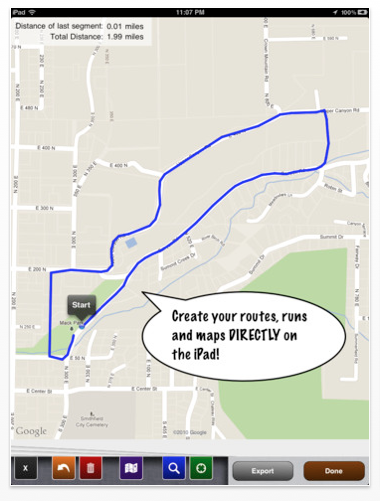 Offering features that no other application available on the iPad market today can compete with, Map Draw allows users to create their own routes and maps directly on the iPad. With just the touch of a finger, users can track and save distances, routes and plans. All maps can be drawn on freehand and then exported, making it the ideal tool for anyone looking for a mobile and versatile navigation tracking system. All entries are stored in a professional and elegant journal-style interface on the device and no uploading to or downloading from a website is needed. During the first week of its release (Beginning 9/14/2011), Map Draw will be offered at 50% off of the regular price. Be sure to purchase this App on sale! "Whether you are a runner, biker, businessman, student, parent, world traveler or just an average Joe, we have no doubt you will find this app to be an invaluable tool" Flammer concluded. drahtwerk today is pleased to announce the release and immediate availability of the Timelapse Pro 3.5 software update. 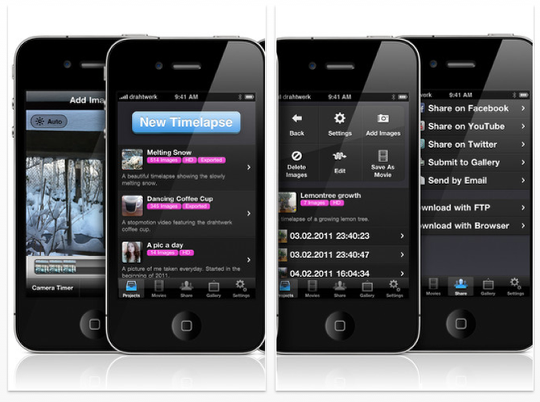 Timelapse Pro 3.5 enables users to create high-definition timelapse movies with the iPhone and iPod touch. Timelapse Pro 3.5 introduces more than 30 new features and improvements. The most prominent new features are the new camera UI with features like a grid overlay, focus-lock or exposure-lock. Also new to this version are background reminders that remind the user to take new pictures for a project. The gallery introduced in Timelapse Pro 3.0 was a tremendous success with more than 850 videos online. Timelapse Pro 3.5 dramatically improves the built-in gallery with sharing features, categories and the ability to comment a video within the app. Sprightly Software today announced Golf Solitaire 1.2, an update to their popular solitaire game for iOS. 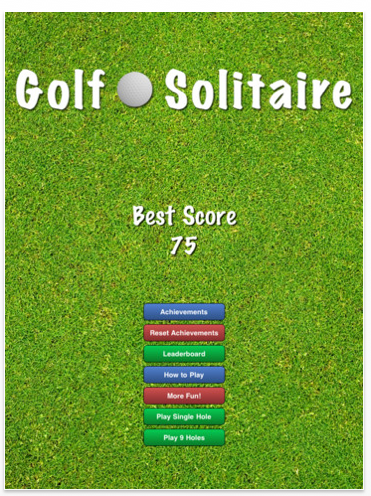 Golf Solitaire is a fun, addictive, and highly entertaining solitaire game. It’s played by trying to match a card that is one number higher or one number lower than the last card. Version 1.2 includes 4 new Game Center achievements, a new single hole mode, a new icon, and minor bug fixes. Users will have lots of fun trying to make your way through 9 challenging rounds, all while trying to keep their score low as possible and clear each board. Players can earn Game Center achievements while they play. They’ll work their way through the Rookie and Veteran ranks, and with a little luck, they’ll become a Golf Solitaire Master! Golf Solitaire features large print high-definition graphics, intuitive game play, Game Center achievements, golf-themed sound effects, an amusing winning animation, an undo button with unlimited undos, a mute button to disable sound effects, and easy to understand instructions.